Every two years the ARC Centre of Excellence for Environmental Decisions brings its people together in one place to share new ideas, reflect on what’s been happening and plan for the future. 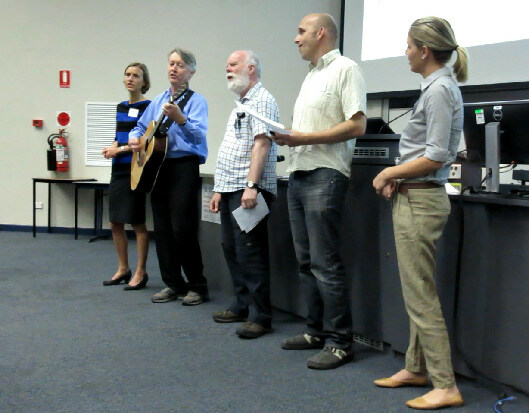 In December, CEED’s 2015 conference was held in Canberra at the Australian National University. As always it generated a wealth of ideas, catalysed new collaborations and gave CEED’s members a few insights on what their far-flung cousins (ie, members from different states and countries) are getting up to. As with past conferences, a good deal of creativity was on display as the different nodes used a variety of techniques to convey the ideas behind their research. Researchers from the UWA set up a series of mock interviews between a ‘current affairs’ journalist and an archetypical regional politician, an economist and a farmer. The topics discussed were ecological restoration and ecosystem services, and the interviews explored the various values different parts of the community held about restoration. 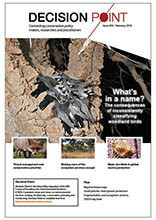 UWA songbirds lament the many challenges of restoration (to the Beatles tune ‘Yesterday’). The UQ node staged a play in which conservation planners drew up a reserve network for Middle Earth (which happened to be located in New Zealand) in order to best conserve giant spiders, elephants (which are now quite rare in New Zealand) and great eagles. The play explored the various tensions and trade-offs between different protected-area configurations with actors representing politicians, conservationists and researchers, all with their own points of view. Much fun was had by all, as well as the innovative sharing of big ideas. There were also several original songs sung during the proceedings. All of which made for a memorable and possibly unique meeting for an ARC Centre of Excellence. In addition to the inter-node presentations, the conference heard keynote addresses from Dr Fiona Cameron on the work of the Australian Research Council; Professor Peter Kareiva from TNC and UCLA on conservation in the Anthropocene; Professors Emma Johnson (UNSW) and Mark Burgman (UMelb) on gender equity and conservation science; and Professor Cath Lovelock on mangroves and sea level rise. There were also presentations from CEED’s partner organisations in the United States, United Kingdom, Israel and Ireland. Throw in planning sessions, media training and nature walks and it’s pretty sure everyone’s interest was catered for.